The menace of Iran-inspired terror groups operating in Bahrain at the instigation of their handlers is not yet over it seems. The death last week of a young policeman in a terrorist attack in a Bahrain village points to that. Such a strike in Bahrain was not expected. At 6 in the evening, a gang of thugs overwhelmed a patrol car in the village of Karbabad with a barrage of Molotov cocktails leaving one policeman dead and two injured so seriously they had to be sent to an ICU. Also last week, Bahrain’s Foreign Minister Shaikh Khaled bin Ahmed Al Khalifa, while speaking at the Islamic Summit in Istanbul, had warned against the threats posed by the Iran-backed Hezbollah terrorist group in the Gulf. Bahrain has already blacklisted the outfit and accused Iran and Hezbollah of interfering in the internal affairs of the six-nation oil-rich Gulf Cooperation Council countries of which Bahrain is a member. Virtually as a riposte, the attack in Karbabad came the day after the statement. In the wake of the troubles in Tunisia, Libya and Egypt in 2011 which culminated in regime changes, Iran, which had been stoking fires of sectarianism in Bahrain for a number of years, saw its opportunity and went into high gear to attempt to topple the regime through its Bahraini-based hatchetmen without realizing that the nature of polity, social fabric, demography, economy, infrastructure and welfare schemes prevalent in the Gulf countries were altogether different from the ones which prevailed in the ill-starred North African enclaves where the so-called Arab Spring originated. 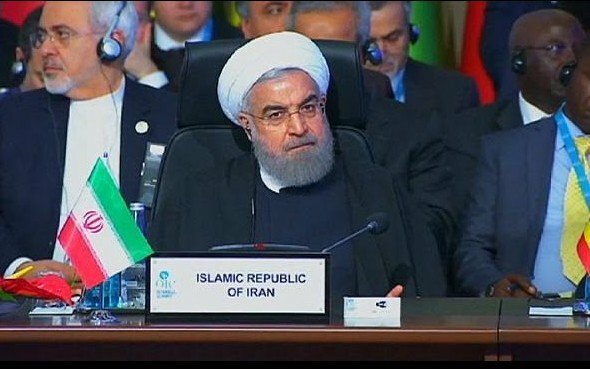 Rouhani looking very stern at the OIC before the strike in Bahrain. No wonder the Iranian and Hezbollah designs did not succeed and over successive years the local shia outfits’ attempts to win international support and local sympathy failed. The leading factions among those outfits also rejected successive offers of talks with the government or, if at all they took part, they were cussed, tended to raise frivolous objections and eventually walked out. In the face of the government’s tough security measures to safeguard people and the public and private property and refusal to get provoked, the opposition then resorted to desperate measures such as tyre-burning, planting of fake or real bombs, Molotov attacks on a resolute police force and a well-entrenched security system, attacks on educational institutions and burning of ATMs. Al Wefaq, the largest among the opposition groups with direct links with the high and mighty in Iran, also tended to make treasonable statements though when its leader Ali Salman was confronted with his alleged pronouncements in the court of law he denied having made any exhortations for regime change. Yet, when it came down to condemning the attack on policemen the leading opposition groups were so mealy-mouthed in their condemnations of what they chose to call the “incident” when it was actually a terrorist attack that it almost amounted to their having said something only for form’s sake and were condemned as “shameful” by the Justice Ministry. The Iranian hand in Bahraini disruptive incidents has been exposed time and again, their minions including misguided local youth have been caught and nailed in large numbers in the courts in the last year or so, and as recently as 20 April US President Barack Obama and King Salman of Saudi Arabia in their talks have taken note of the challenges posed by Iran’s provocative activities in the region. It is time it saw the futility of its actions and desisted from further aggravating the situation in the Gulf.